Driftwood Theatre proudly announces the cast for Play in a Pub: The Jedi Doth Return – the final chapter in William Shakespeare’s (courtesy of Ian Doescher) epic galactic saga. 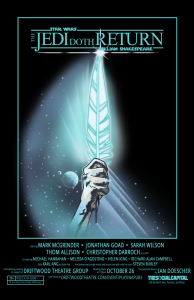 The cast reading this extraordinary blend of classical theatre and pop culture is led by Jonathan Goad (Stratford Festival) as Han Solo, Sarah Wilson (Soulpepper Theatre) as Princess Leia, and Mark McGrinder (Studio 180 Theatre) as Luke Skywalker. Joining them is a star-studded cast including Thom Allison as Lando Calrissian, Michael Hanrahan as Darth Vader, Melissa D’Agostino as R2D2, Christopher Darroch as C3P0, Helen King as Chewbacca, Richard Alan Campbell as Yoda, Karl Ang as Boba Fett, and performing all sound and music using only his voice, Steven Burley. 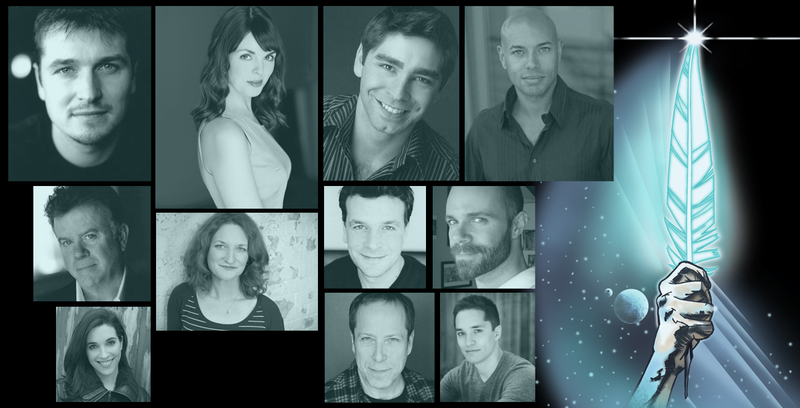 This incredible group of performers is set to take the stage for a reading in support of Driftwood Theatre on October 26 at The Social Capital Theatre in Toronto. Tickets on sale now! Play in a Pub 2013. Michael Hanrahan’s (far right) Darth Vader puts the choke on Andy Pogson’s Admiral Motti as fellow PIAP readers (clockwise from top left) Sarah Wilson, Joseph Ziegler, Dion Johnstone, Karl Ang and Oliver Dennis play on. This fall, the epic saga concludeth. In a pub. Driftwood Theatre’s Play in a Pub returns for a third year to bring to a close the most epic saga ever penned by the illustrious Bard (also known as Ian Doescher)! 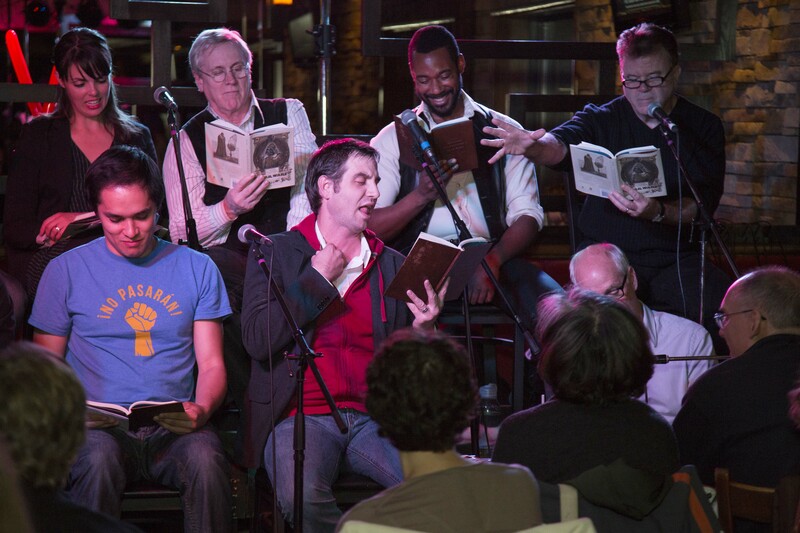 The stars of the stage come together in a pub very, very nearby for an evening of theatrical and cinematic mash-up of Shakespearean proportions in support of Driftwood Theatre. And let us not forget that Play in a Pub is an interactive event! Audience members can get in on the action by participating in the Rebels, Imperials and Droids n’ Creatures Live Auction, and bid on one of three walk-on character tracks – rebels, imperials, or droids n’ creatures. Whether you are an rebel sympathizer, a cold-hearted imperial or a misunderstood droid, there is a role for you to play in the evening’s reading. The Live Auction takes place immediately prior to the reading. Audience member Steven Harrison takes the stage as a beleaguered Exogorth (look it up), to the delight of the cast, during Play in a Pub: The Empire Striketh Back. And back just in time for Halloween is Driftwood’s Star Wars Cosplay Competition. In the spirit of the season, we’re inviting guests to attend the event dressed as their favourite Star Wars inspired character. There will be a cash prize for the evening’s best costume. But the evening’s galactic epic-ness doesn’t end there! Guests can look forward to bidding on some incredible themed baskets at the jawa-worthy Cantina Market Auction. Driftwood Theatre’s board of directors is putting together a fine selection of themed baskets, from Prince Edward County wine, to Craft Brews, to Toronto entertainment packages and the coveted Star Wars Basket – filled with Star Wars paraphernalia and goodies. Tickets for Play in a Pub: The Jedi Doth Return are now on sale here. Guests have the option of two ticket prices: General Admission for $25 or a special front-of-the-line Jabba’s Palace VIP ticket for $40 including reserved seating, the VIP treatment and some special goodies. This year’s Play in a Pub will take place at the Social Capital Theatre at 154 Danforth Avenue (2nd floor) in Toronto. The last two Play in a Pub events sold out – so don’t miss out, order your tickets today! It is going to be an epic finish to Shakespeare’s galaxy-spanning saga. http://www.driftwoodtheatre.com/wp-content/uploads/2015/10/PIAP-Cast-announce-website.png 612 1200 David Jeremy Smith http://www.driftwoodtheatre.com/wp-content/uploads/2018/10/DTG-logo-CURRENT-inverted.png David Jeremy Smith2015-10-01 12:44:312015-10-01 12:44:31Together again, huh?